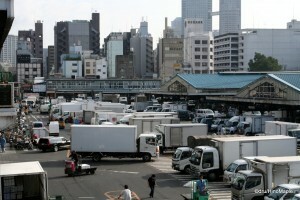 Tsukiji is one of the most well known places in Tokyo, if not Japan. 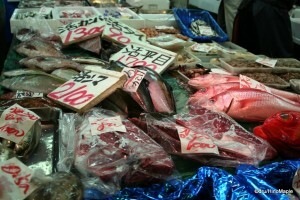 There is only one thing to do while in Tsukiji, visit the Tsukiji Fish Market. In reality, when you head there, you can’t really do anything else. The area itself is very small and there isn’t much else to do but look around. If you venture in on your own, you can expect to spend at most, one hour walking around. It’s unlikely that you will want to spend an entire day, and unless you are a chef or restaurant owner. The fish market itself is located fairly close to the station. If taking the Tokyo Metro subways, the Hibiya line’s Tsukiji Station is the closest. However, it isn’t the closest station to the market. For that, head on the Toei Oedo line and get off at Tsukijishijo Station, which literally means, Tsukiji Fish Market Station. From there, follow the signs and you’ll be right outside the fish market. Finding your way in is one of the most difficult things to do. It looks like a large mess of trucks going in and out of the market. There is no specific passenger entrance and everything looks chaotic. Take your chances and just walk in from any entrance. There are various places around the market itself to take photos, but do remember that flash photography is frowned upon inside the market. If you are looking for a guided tour, there are various people who offer tours, but by and far the best looking one is by Naoto Nakamura (link below) who takes you on a two hour tour of the fish market starting at 4am. This is great on the first day of your trip, especially if you are jet lagged. You’ll be able to visit the various auctions and also see many of the middlemen selling their foods. Do note that due to many tourists abusing their privileges, the market was closed at the end of 2008, till early 2009 to tourists. While this was localized to only the auctions, it was still sad to hear about this. It is now completely open to the public, aside from restricted areas, and you can freely watch the auctions. See the information in the links below for more information. As mentioned, the entire fish market feels chaotic. You MUST be careful. There are a lot of sites with information on what to wear and how to be prepared. It is necessary to read them, but the basic run down is this: wear shoes you don’t care about, and no high heels or sandals; don’t dress too stylishly; no flash photography, especially in the auction areas; and look out for any and all moving vehicles. While the market is open to the public, everyone should be reminded that the market itself is still a place of business. Many of the men on the dollies are racing to get the fish from one end of the market to another, or even outside the market. If you step in front of them, they will not stop. It’s important that you don’t block the street, and finding out where the street is can be a challenge in and of itself. Some areas are clearly marked, but others aren’t. Thankfully, most of the dollies and trucks are gas powered, so it’s easy to hear them, however, even in the middle men market area, the trucks can appear out of nowhere. 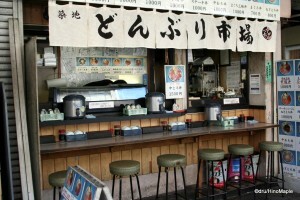 Inside the market, there are several shops selling sushi, sashimi, donburi, and various kitchen tools. It can be easy to miss, but it’s nice to just walk around a little. The shops tend to be slightly overpriced, and busy. If you go on the weekend, there could be a long line-up. I would recommend waiting until you leave to eat any sushi. 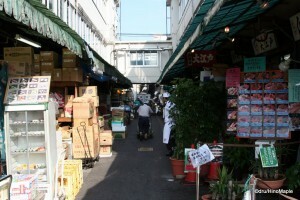 Just outside the north side of Tsukiji Market is a small shopping area with various sushi restaurants. This area itself is reasonable and you can get a lot of good food that’s on par with other shops inside the market. If you looking to buy sushi and take it home, or to your hotel for a late morning breakfast, the middlemen inside are more than happy to sell a large amount of fish to you. Do note that the days after the holidays can be the best to get the freshest fish, and the days before the holidays can be the cheapest as they have to sell everything. Buying fish should be done after 6am, especially if the auction is held until around 6am. Usually, I found arriving around 8am is a good time. You can check out all the food, although a lot has already been sold, and you can still get a good breakfast after all the regular workers have eaten and headed to work. 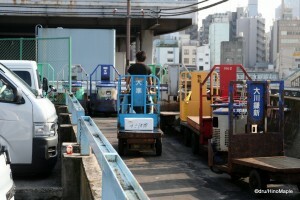 In the last several years, there has been talk of moving the Tsukiji Fish Market from its current location to a location closer to Odaiba. There have been lots of vocal people protesting against this. While it’s true that a move will likely destroy the history and atmosphere of the current Fish Market, it feels almost inevitable due to the government wanting a more controlled setting for the fish market itself. Moving it would allow things to be modernized and flow smoothly. Plus, the current plot of land is worth a lot more as residential and commercial buildings than as a fish market, regardless of being a tourist attraction. I myself am indifferent, but as a tourist, I would want it to stay in the current location. As a worker inside the fish market, I would probably want it to stay as well. In fact, the move has been delayed indefinitely as the future site is contaminated with various toxic materials. For those who were worried about missing this fish market in the near future, don’t worry too much. It will be several years yet before they move. This entry was posted in Tokyo and tagged auction, chef, fish auction, fish market, japan, market, meat auction, middlemen, Naoto Nakamura, Odaiba, restaurant, sashimi, sushi, sushi restaurant, tokyo, Tokyo-to, Tsukiji, Tsukiji Fish Market, Tsukiji Market, Tsukiji Station, Tsukiji-shijo, Tsukiji-shijo Station, Tsukijishijo, Tsukijishijo Station, vegetable auction, 台場, 大台場, 大江戸線, 日本, 日比谷線, 東京, 東京都, 築地, 築地市場, 築地市場駅, 築地駅, 魚 by Dru. Bookmark the permalink.